La question est de celles qu'il a été longtemps malséant de poser en France, comme toutes celles qui portent sur cette époque : que s'est-il passé du côté des arts en France pendant l'Occupation ? Résistance ? Collaboration ? Retraite prudente ? On s'en tenait au plus simple, un peintre par attitude : Picasso pour la Résistance, Derain pour la collaboration, Matisse pour la retraite discrète. People may be getting Benghazi fatigue but here's something that I haven't heard anyone pick up on...or I'm missing a lot of analysis. Here's the first part of Obama's debate answer to the question on Benghazi. PRESIDENT OBAMA: Well, let me, first of all, talk about our diplomats, because they serve all around the world and do an incredible job in a very dangerous situation. And these aren’t just representatives of the United States; they’re my representatives. I send them there, oftentimes into harm’s way [my emphasis]. I know these folks, and I know their families. So nobody’s more concerned about their safety and security than I am. So, here we have Obama admitting that the "buck stops here." He is responsible for the safety of our diplomats and their staff because he sends them to their assignments. Why then is the media letting Hilary take the fall (a rhetorical question)? She's only second in command in foreign affairs. We have it in his own words; Obama is the boss and nobody is more concerned about their safety than he is. The diplomats are not Obama's diplomats, just like the secretaries (of state, defense, etc) are not Obama's secretaries (an issue that came up earlier during the Obama administration) and the members of the U.S. military are not Obama's soldiers; they serve the United States, and the United States only (as well as her people), in the same way that… Barack Obama himself is supposed to serve the United States. He is the people's servant, not their lord and master. This is why the oath of all of the above — not least the (incoming) president himself — is not to the president, but to the U.S. Constitution. Obama 1 - 1 Romney? France 24 holds a debate about Barack Obama's alleged rebound in the second presidential debate (part 1 and part 2). Barack Obama rebounds in the second presidential debate, partly thanks to Mitt Romney’s "whole binders full of women" remark, but uncertainty abounds in the homestretch of a race where both candidates look to energise their own supporters and convince the shrinking sliver of undecided voters. • Garance FRANKE-RUTA. Senior Politics Editor, The Atlantic (from New York). Produced by Anelise Borges, François Picard, Mary Colombel, Shamira Muhammad. So much for the never-ending caterwauling from our all-knowing, all-caring brothers and sisters regarding the intellectual heft they bring to bear when it comes to discussing the "issues". More evidence of French people starting to fear that Barack Obama's presidency is starting to unravel comes from a special issue of Le Nouvel Observateur called Travels Through the America We Love and the America that Scares Us, the good America being the left-leaning USA "of the poor" represented by champions of the poor like Barack Obama, George Clooney, and Scarlett Johansson, and the latter being the USA of "the rich" symbolized by people like Mitt Romney and Arnold Schwarzenegger (an Austrian immigrant?!). And now, all of a sudden, only weeks from the 2012 elections, that type of articles has started sprouting again — as in Le Monde's series of 10 stories called "Un Œil sur l'Amérique" (An Eye on America), with the photos of a Carlos Javier Ortiz or the byline of a Philippe Bernard who take (needlessly to say) exclusively a negative view on, for example "the new field hand convicts" or the Remote Area Medical association which "crisscrosses the United States to dispense free medical and dental care to those most in need." 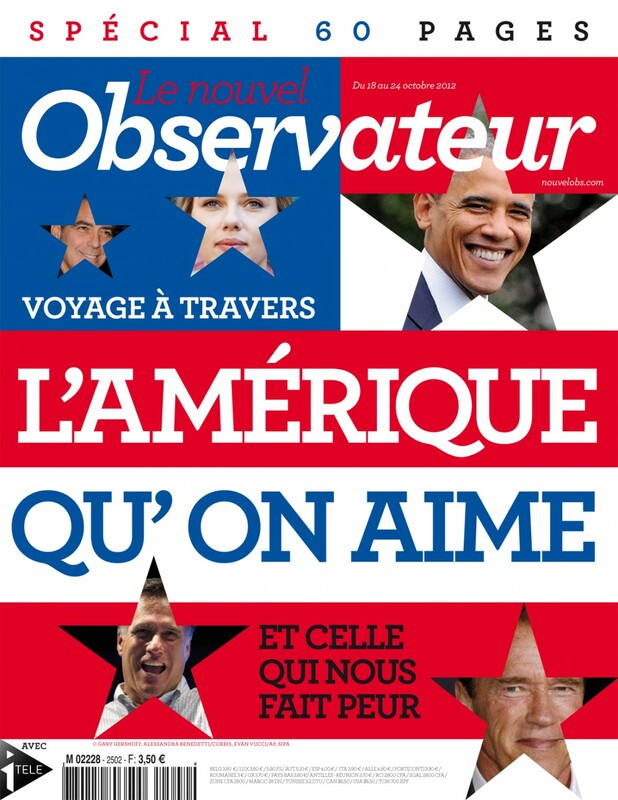 Is this not evidence that Le Monde is starting to believe in (or to fear) the victory of a Mitt Romney ?! Well, I think Romney did as well as could be expected — although I keep wanting him to bring up the Russian mike episode, along with his dissing of Russia and China's foes, Lech Walesa and the Dalai Lama — both of whom happen to be fellow Nobel Peace Prize recipients. Obama did look petulant a lot of the time, and his serving as time keeper did him little to no good… I agree with Jack Straw: "Draw. Victory goes to the guy leading. Romney." (as well as the president of the United States) or is he the time keeper? • 10:29 Obama hardly looks presidential as he fidgets in the background, does he? • 10:18 For Christ's sake, Mitt, BRING UP FAST AND FURIOUS! • 10:17 AK-47s?! Assault weapons?! • 10:06 Have to give it to him: Good Obama zinger on pensions — "mine isn't as big as yours"
• 9:50 Why is it that I am thinking that Obama knew about the Bush question beforehand? • 9:45 Another fake independent! • 9:30 war on women: "more women living in poverty than four years ago"
• 9:25 Mitt Romney quoting Joseph Biden: middle class "buried these last four years"— excellent! • 9:11 I'm sorry, Candy Crowley; when either candidate makes any such attack, you allow them to respond. Period. • 9:10 So that's Obama's aggressive strategy?! • 9:09 Good point that Barack Obama "took General Motors bankrupt"
• 9:06 Barack Obama "investing in energy" ?!?!?! "The truth is, many of us are on a cliff, watching this widening gulf of black poverty and dysfunction, fearful that we’re just a heartbeat or two away"
Le Monde publishes an op-ed by black reporter Steven Gray that it translated from English (cutting large swathes of text while switching paragraphs around in the process and perhaps taking paras from one or more columns) and which says that Barack Obama was never the champion of blacks that he claimed to be. Aucun des deux grands partis, cependant, n'essaie sérieusement d'attirer les voix des Noirs. Ils partent de l'hypothèse que les Noirs iront voter en nombre et qu'ils donneront leurs voix à Obama – notamment dans les Etats pivots du Sud comme la Caroline du Nord et la Virginie, où les Noirs représentaient en 2008 près de 20 % de l'électorat. Cette hypothèse, toutefois, néglige l'ambivalence croissante des Noirs à l'égard d'Obama. La vérité est que la participation électorale des Noirs pourrait, cette fois, être faible. La relation d'Obama à l'Amérique noire a toujours été délicate. Fils d'un père kényan et d'une Américaine blanche, Obama a grandi à Hawaï et en Indonésie – loin de l'expérience traditionnelle des Noirs américains. Il n'a vraiment compris les problèmes raciaux particuliers de ce pays qu'à l'université, et après son mariage avec Michelle Obama, une descendante d'esclaves dont l'expérience familiale reflète l'émergence de la classe moyenne noire américaine. En tant que jeune politicien agissant dans le quartier difficile du South Side à Chicago, Obama se trouva confronté à une double réaction contradictoire : le scepticisme des Africains-Américains trouvant qu'il n'était "pas assez noir", et les craintes des Blancs pour lesquels il l'était trop. … il a refusé d'apporter des solutions sérieuses à la crise économique qui touche particulièrement l'Amérique noire : près de 14 % des Noirs sont au chômage – soit près de deux fois le taux national – et ce chômage se manifeste même parmi ceux ayant suivi des études supérieures. Près d'un quart des Noirs ne possèdent aucun autre bien que leur voiture. La classe moyenne de l'Amérique s'effondre, mais sa fragile classe moyenne noire est tout simplement en train de disparaître. 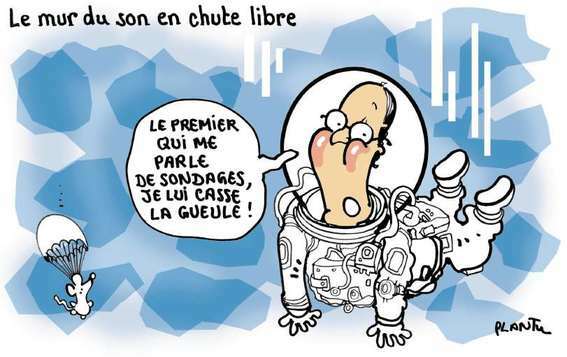 Le premier président noir ne peut ou ne veut pas répondre explicitement à ces inquiétudes bien réelles. Personne ne s'attendait à ce que le détaché et cérébral Obama se comporte en militant. Ce n'est pas son style. Mais la vérité est que l'amorce de redressement économique du pays n'a toujours pas bénéficié aux Noirs. Un moment charnière a eu lieu en octobre 2011, quand Obama a déclaré lors d'un dîner organisé à Washington par la Congressional Black Caucus Foundation qu'il fallait "cesser de se plaindre" des difficultés économiques des Africains-Américains. 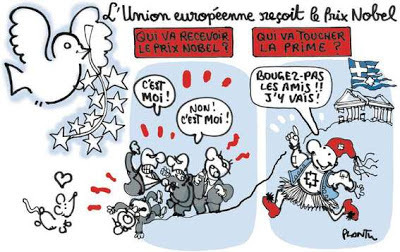 • Plantu: Who Will Be Handed the Nobel Prize? 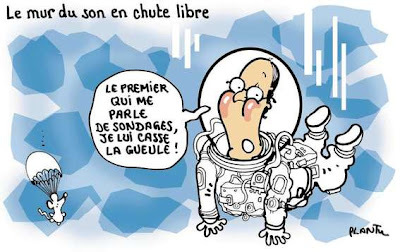 • Plantu: Who Will Cash the Check? • Greek citizen: Don't trouble yourselves, pals!! I'll go get it!! It took Damian a long long time to post ("There was a lot to track down"), but E-Nough has an in-depth Special Fightin' Bitin' Biden Post-VP Debate Edition that I drunk-blogged between 3 and 4:30 in the morning Paris time, that is replete with facts and figures and analyses, and that is a must-read. Q: In March of last year, President Obama explained the military action taken in Libya by saying it was in the national interest to go in and prevent further massacres from occurring there. So why doesn't the same logic apply in Syria? Vice President Biden? is Libya, one-fifth the population, five times as large geographically. This is the sort of thing not often served up in these debates, a statement of nonsubjective checkable facts. So we checked. The land area of Syria is 185,180 sqk, with a population of 22,530,746. The land area of Libya is 1,759,540 sqk (9.5x Syria, Mr. Biden off by a factor of 2), with a population of 5,613,380 (25% of Syria, Mr. Biden off by a factor of 4). Oh, you say, the man just got his facts wrong. Yes, yes he did, but he used the inverted numbers to argue administration policy. If he really understood what he was saying -- if an actual Syrian policy were based on a Libyan geography and population density model -- he would have realized that his numbers were wrong, that his argument was turned on its head. That makes it both a conceptual and a comprehension error, not simply an error of fact. How many post-debate analysts caught this? [Maddening suspense.] Not a one that we know of. Yet everyone was very impressed with Mr. Biden on substance.